What is High Power Rocketry? Many have been exposed to Model Rockets, mainly Estes kits and motors. Small, cardboard and balsa wood rockets that fly on black powder motors, and are recovered via parachute for repeated flights. High power rocketry is similiar, but larger. The motors used are larger, and more complex. They use composite propellants (similiar to that used in the Space Shuttle's solid rocket boosters) rather than black powder. Most high power motors have reusable aluminum casings for lower per-flight costs. The rockets themselves are much larger, and stronger construction materials are used such as fiberglass, plywood, phenolic, etc. 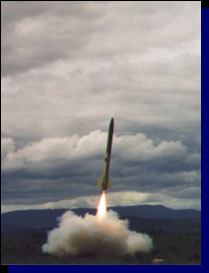 For more information on High Power Rocketry visit Rocketry Online. They have a plethora of information on the subject.